Prominent & Leading Manufacturer from Hyderabad, we offer liquid waterproofing compound for plasting industry. We have cut out a position in assembling, and supplying the best quality Liquid Waterproofing Compound that enhances free stream arrangement of cement, the offered waterproofing compound is generally checked at our end on quality angles for supplying an immaculate reach. 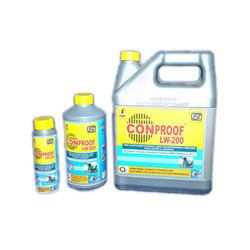 This waterproofing compound is handled utilizing incomparable class fixings according to the set business standards. Looking for Liquid Waterproofing Compound for Plasting Industry ?